A Box of Six 0.75 oz. Resealable Pouches. Consisting of mild to medium strength, the very mild flavor of this Red Cap pipe tobacco provides every smoker with a trace of splendid Cavendish tobacco that allows for the rich taste and flavorful aroma. 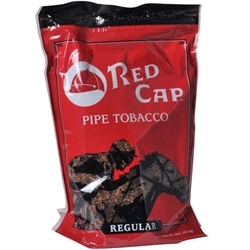 Smokers Discounts offers great prices on this Red Cap pipe tobacco. Try it today and enjoy!